Which History Does Fossils Represent? 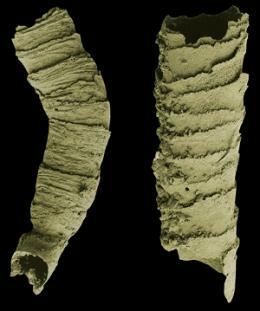 A recent statistical analysis was published in Science which suggests the fossil record does in fact reflect a realistic version of the history concerning life on earth. Biodiversity has been a curiosity with Paleontologists who are concerned with bias conclusions and wonder if the fossil holds a true representation. It is quite clear, the fossil record does not show transitional species with evolution of various kinds morphing into new creatures from common ancestral predecessors. The researchers are simply assuming the biodiversity found in the fossil record demonstrates it which is circular reasoning. Indeed it did 4,300 years ago! In creationism, we believe catastrophic changes in the environment was responsible for in having an effect on the biodiversity of creatures discovered in the fossil record but not the evolution of those life-forms, only the order in which they were buried! Over 200 million fossils have been collected but yet there remains large systematic gaps in the record. Darwin skeptics have pointed out there should be more transitional creatures than fully evolved species because it takes so many changes to get to the next animal. The record has shown, there are not many alleged transitional creatures and the ones that have been labeled as such are highly questionable which falsifies the notion of a gradually unfolding tree of life. Wow and there you have it! Sounds familiar? An author uses his imagination to create a story such as science fiction where a person imagines what an alien being would look like, say and do. They come up with impossible transportation which can fly millions of light years in a matter of seconds or minutes. This fills in the gap on not actually discovering alien life forms and their supposed spaceships. Is imagination used for such things as science fiction movies really a powerful tool for filling in the fossil record? This in no way replaces empirical science, even knowing part of the track record on various guesses made by scientists concerning unobservable data, it’s generally way off from reality. The bottom line is this, evolutionary thinking is an illusion based on rebelling against the concept of an intelligent Creator namely God. It’s also an illusion to claim that no amount of data ever falsifies Darwinism, because they have the answers using their imagination which they believe will eventually come true through new research. And if it doesn’t they use more imagination for the next illusion of reality which turns out to be circular reasoning. How often times have you heard, this is science using a storyline or writing a script for it? So what makes you think this is really science? Hind legs reported on snake fossils says, MSNBC. This seems to support the idea in the evolutionary story that snakes descended from lizards, and lost their legs through evolution. Eupodophis descouensi is said to have .8 inch legs with ankle bones but no feet or toes. The evidence here requires imagination, because clearly they were not used for walking. But why would useless structures remain 4 to 22 million years? However, researchers tells us that the puzzle of the evolutionary story will not be solved in 10 years rather it may be solved one day with various teams working on it. It still remains a mystery on whether or not the leg loss was an increase of genetic information, or in fitness. For example, flightless birds are adapted for their land-based habitats, but it would be a notch higher for birds to evolve from ground to air than the other way around. Perhaps research teams are still working on this part of the story. Evolutionists are clueless about not only their own theory of common ancestry, but the old-age framework as well. Many reports come out all the time with more puzzles which increases speculation than increasing real knowledge with a singing praise to the evolutionary story. But it’s not reality. Rather than spending a ton of hard earned money on trying to figure out the myth of snake evolution which has no ending, what about putting that amount of money and energy into things like biomimetics? There are all kinds of great research going on in this area! Research teams are needed because they haven’t come close to doing what a ATP synthase, or a flagellum, mother-of-pearl, or a ribosome or even a dragonfly wing has been doing now for millennia. It incorporates engineering concepts that eventually will lead to something that will benefit mankind like human health, and technology which will be useful when they gain knowledge about the engineering of nature designed by God. As far as research in Darwinism: Go forward? No, backwards? No, sideways? Answer: No snake evolution or any Darwinian evolution for that matter! Ah, so that is what happened, the missing fossils in the Cambrian Explosion are hidden in the Precambian closet, where nobody has been able to observe even though the closet is wide open for inspection. Suzanne Porter one of the leading authors of this story admits she doesn’t know what the animals looked like that made the first shells. However, she suggests that the animals did not “passed on their skeleton-making skills to any descendants, which implies biomineralization was ‘re-invented’ a few million years later.” Are you pondering about how this miraculous event could have occurred giving us a supposed faulty perception of creationism? Porter explains, “Skeletons evolved more than three dozen times within animals – and about half of these did so in the early Cambrian.” Wow, that fast, huh? This is a classic of defying simple logic, here these modern scientists with PhDs are claiming to be playing a game of cards without having a deck so they can challenge others to the contrary. It may not look like they are playing cards but actually they claim they did, even though we don’t see a deck of cards because the game was so quick (quote that one, greg). Such utter nonsense of absurdity and an utter waste of taxpayers money in order to explain the Cambrian Explosion! The Cambrian Explosion is not evolution looking like “Creation” what we observe, the sudden appearance of animals in the fossil record, is creationism! This is where the science points to, it confirms the Biblical account! Once again, scientists find a fossil graveyard with indications of a rapid burial and exquisite preservation. There was an omission that they could have told the readers. Cretaceous which was thought to have been extinct 65 million years by the evolutionary time frame was found swimming in 1938 off the coast of South Africa. This raises some interesting questions and comments about how stretched-out chronology is becoming more common in evolution, this discovery suggests in the evolutionary time frame, coelacanths supposedly never left another fossil for 65 million years, and the soft tissues discovered in these fossils were never disturbed for 250 million years? Evolutionists are trying to distract such a conflict which exists within the evolutionary theory model on what the bones are really telling us. T-Rex was thought to be a rare exception when soft tissue was discovered, it became very controversial but that was only the beginning! Soft tissue found in these animals and future ones verifies creationism!